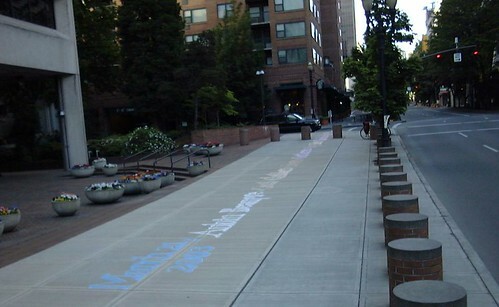 Since Memorial Day 2007 Nancy Hiss has been chalking the names of coalition soldiers who died in Iraq on the sidewalks of Portland, Oregon. The names have wound through, SW, NW, N, NE and SE Portland, over 12 miles in a continuous line from the Federal Building to the center of the Burnside Bridge. 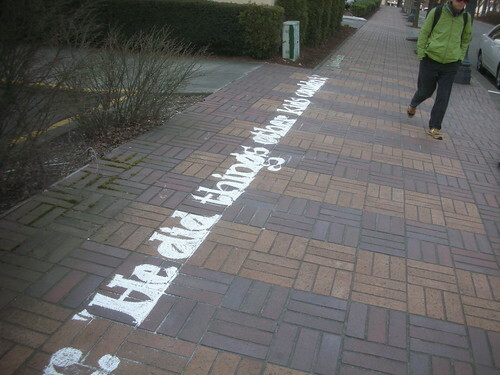 To date she has chalked about 4770 names. There are about 30 more she will chalk between now and Memorial Day. On Memorial Day, Nancy will join Veterans For Peace chapter 72 at Peace Park. This will be the 4th year she has written the word peace in the languages of the nations we have been at war with. On Memorial Day, Monday June 31st, Nancy Hiss will be at Peace Park along with the Veterans For Peace. 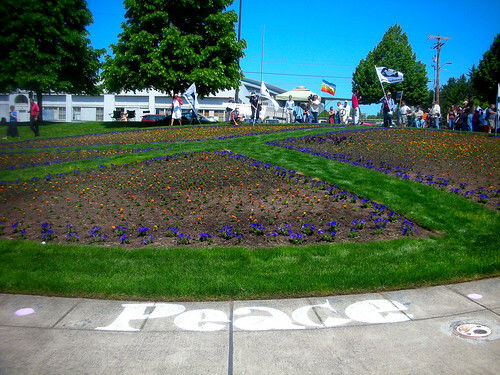 Nancy will be chalking the word PEACE around the walk at Peace Park. 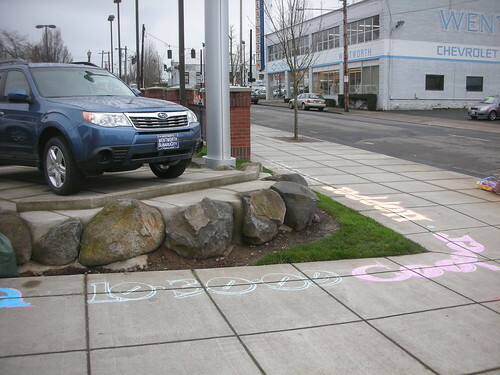 Nancy will get there about 9am to start chalking. The Veterans For Peace are gathering at Memorial Colosseum at 11:30, holding a ceremony at noon and then having a From War to Peace walk to Peace Park. On Sunday, June 30th (like most every other Sunday), Nancy will chalk the name of a soldier who has died in Iraq. 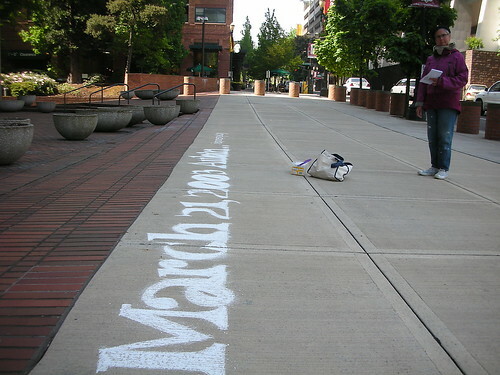 She has chalked a continues line across SW, NW, N, NE and now SE Portland for the last 3 years of the names of soldiers who have died. She is currently heading North on SE Ankeny. 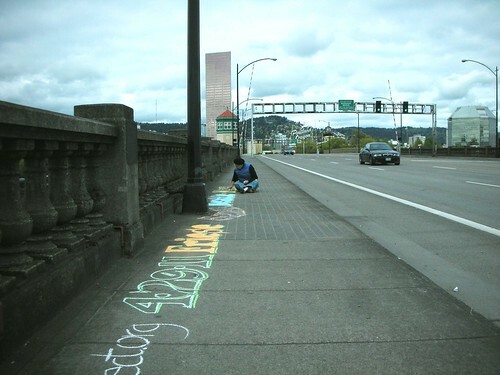 She is currently at SE Ankeny and 6th Ave.
On Memorial Day, Monday May 25th, she will be at Peace Park, drawing the names of those who have special meaning to the Iraq Names Project. If there is someone whose name you would like her to draw on Memorial Day, just ask. 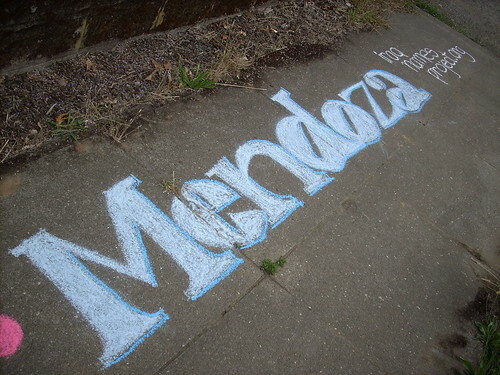 Everyone is invited to come down and help chalk and remember the dead. She is also going to try to write the word “peace” in the language of every nation we have been at war with. Over the course of the Memorial Day weekend about 30 people joined Nancy as she rewalked the Iraq Names Project route. 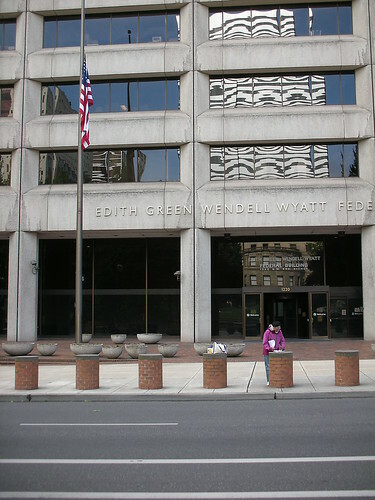 On Memorial Day, as a last act, she ghosted in Sheehan at Peace Park. Last summer Casey Sheehan’s name fell right at Peace Park in a moment of synchrosity. At the start of Memorial Day Nancy was joined by some neighbors, good friend Nikki and Kate Powers & Steve Einhorn. Kate Powers wrote a now famous song, Travis John, about Travis Bradach-Nall, one of the first Oregonians to die in Iraq. Nancy ghosted in Travis’ name when she got to Grant Park, the neighborhood where he grew up. 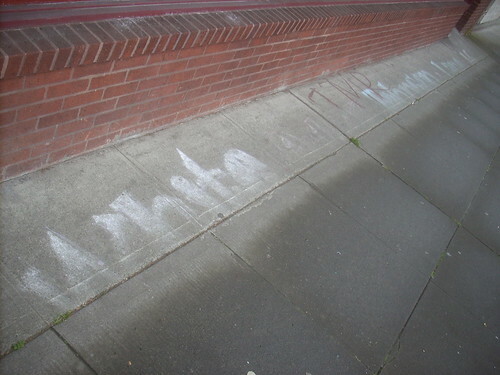 While rewalking the route we were surprised to see names that nancy wrote months ago still visible along NE Broadway. 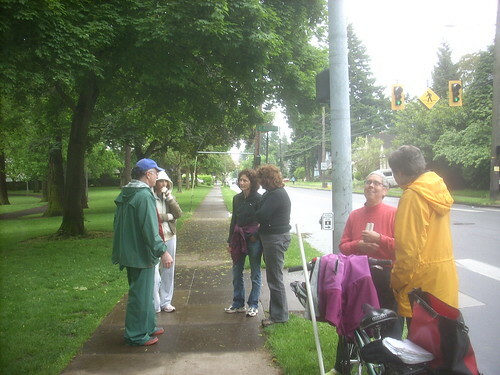 Nancy will be back at NE Multnomah and NE 13th on Friday May 30th, 7:15am, drawing names. 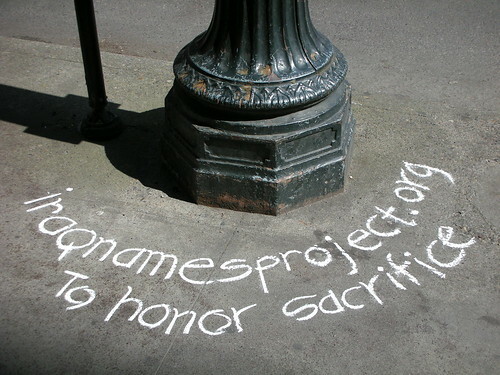 On Memorial Day May 26th, 10am, Nancy will rewalk the Iraq Names Project route from Wilshire Park (NE 33rd and NE Skidmore) to Holladay Park (NE Multnomah and NE 13th). 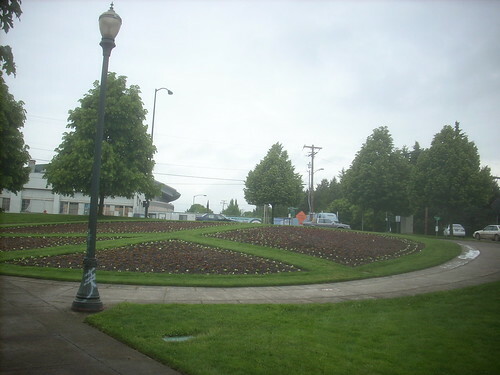 She will then head over to Peace Park (East Side of the Steel Bridge at the top of the Esplanade). Veterans For Peace will be having a Memorial Day picnic there after a gathering at Memorial Coliseum. On Saturday May 24th Nancy rewalked the route from the Federal Building downtown – where she began a year ago – to Irving Park, about a third or the route. She began by ghosting in March 21 2003 Aubin, the way she began a year ago. On Sunday May 25th Nancy was joined by friends to rewalk the second third of the route. 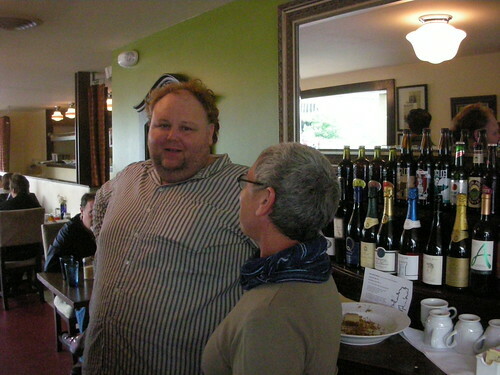 Along the way she stopped to say hi to Chef Christopher at Francis Restaurant. He has been a great supporter of the Iraq Names Project. He served us all a wonderful meal, as usual. You are currently browsing the archives for the Memorial Day category.